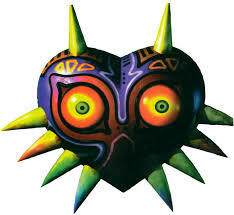 For a long time at every Nintendo Direct where were rumours that Majora’s Mask would be given a re-release like Ocarina of Time was at the 3DS’ launch back in 2011. The mask returns in 2015. On the latest Nintendo Direct at the beginning of the stream, Iwata announced the 3D remake of the well-acclaimed Majora’s Mask which was released on the Nintendo 64 back in 2000. It is expected to be released in Spring 2015. For Europe, a special Majora’s Mask bundle will be released which includes a steelbook case, poster and pin badge.